How to crochet the mushroom stitch!! Materials: crochet acrylic yarn, 5mm crochet hook. This pattern is worked over a multiple of 4 stitches plus 1. For this sample chain 21. Row 1: 1dc into the 4th, 1dc in each chain across. Row 2: chain 3, turn, 1dc into the 2nd, (the turning chain counts as the 1st dc), *chain3, skip 3, 2dc into the next*, repeat from * to * until 5 stitches remain. To finish the row: chain 3, skip 3, 1dc ito the next, 1dc on top of turning chain. Row 3: chain 3, turn, 1dc into the 2nd, (the turning chain counts as the 1st dc), chain 4, 1 puff stitch in each of next 2 spaces ( *yarn over&insert the hook into the 1st space, yarn over ans pull through a loops* repeat from * to * 2 more times, keep the loops on your hook, *yarn over&insert the hook into the next space, yarn over ans pull through a loops* repeat from * to * 2 more times, yarn over and pull through all loops except the last, 2 loops remains, yarn over and pull through 2 loops) this is the 1st mushroom, chain 4, 1puff into the same space, 1puff into the next space ( yarn over&insert the hook into the same space, yarn over ans pull through a loops* repeat from * to * 2 more times, keep the loops on your hook, yarn over&insert the hook into the next space, yarn over ans pull through a loops* repeat from * to * 2 more times, yarn over and pull through all loops except the last, 2 loops remains, yarn over and pull through 2 loops), repeat this pattern across until the last space. To finish the row: chain 4, 1dc into the next dc, 1dc on top of turning chain. Row 4: chain 3, turn, 1dc into the 2nd, (the turning chain counts as the 1st dc), *chain 3, 2 dc on top of next mushroom*, repeat from * to * until the last mushroom. To finish the row: chain 3, 1dc into the next dc, 1dc on top of turning chain. Repeat rows 374 until you have the length you want. Last row: chain 3, turn, 1dc into the 2nd, 1dc in each chain across. 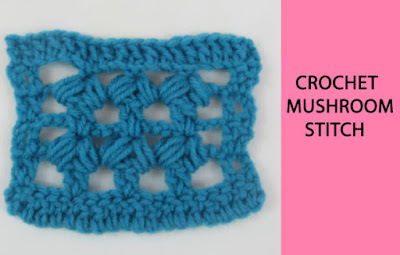 Watch my video tutorial witch shows you how to crochet this beautiful stitch step by step!